This page is just to give you some background about me and my quest for lifetime fitness and if you are interested in mens fitness, female fitness or peak fitness hopefully my site will give you an interesting, if unusual, slant on how to attain the best body for you. Your body is just the beginning. I dreamed of a strong, handsome body from an early age. My favorite movies as a scrawny kid were 'Gladiator' movies. 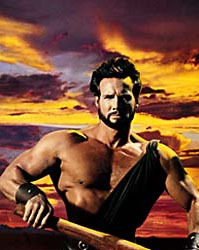 Steve Reeves, a famous body builder and movie star of the fifties, was my hero (see photo). 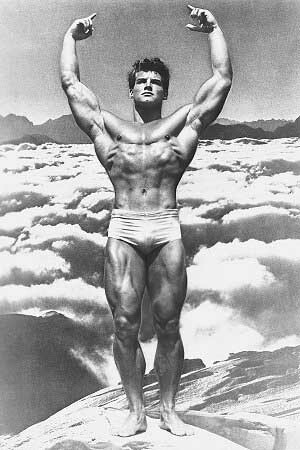 I was enamored with the muscularity and symmetry of these early bodybuilders and wanted to emulate them. I tried many approaches. 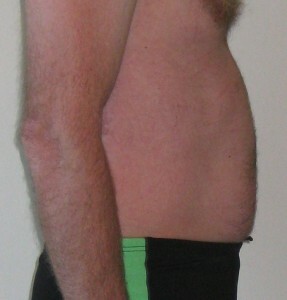 I bought a 'Bullworker' when I was 15 and worked out religiously and only managed to tone up, I tried the Canadian 5BX program, I joined a gym, took up martial arts, cross-country skiing, joined the army, ran, swam, bought a set of free weights, tried various diets (Atkins to vegetarian), protein powders, vitamin/minerals,and joined more gyms. I was often 'fit' but 'fit for what'? I may have had a high level of fitness for particular activities at certain times but I still didn't have the body I wanted. 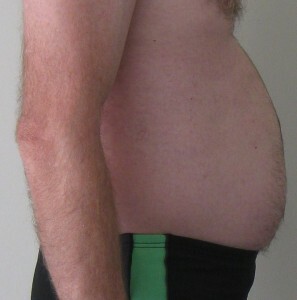 For much of my life, although I was 6'1" (185cm) tall, I only weighed 65kg (143lbs). I remember at a party, a woman crossed the room, to tell me how thin I was. At the age of 32 I managed to get into Army Special Forces. I was underweight for army standards but my girlfriend at the time (an army nurse) convinced the doctor, a friend of hers, to pass me. Even though I became extremely fit in the military I only weighed 60kg (132 lbs), prompting a Company Sergeant Major to ask me one day whether I had been sick!! There are repercussions to having a particular body shape. Being thin or fat does not maximize your potential in the world. People will view you differently to someone with an athletic body shape and they will ascribe a whole range of attributes to you that may or may not be true (more on this later). I left the military and got my degree, had a beautiful child and settled down for awhile but I was unhappy in my relationship and went back to the gym to get some control over my life. Training at the gym helped me make a decision to leave my relationship and under the guiding hands of my mentor/friend/personal trainer, Mannie Hamilton, I put on 5kg of muscle and was finally starting to shape my body into what I wanted. And then Mannie died! At the age of 61, with a superb physique that won him the Mr Fitness Universe title at age 60, my funny, inspiring, loving friend died of a heart attack. Besides the emotional toll of his death it made me question what exactly it meant to be 'fit', because Mannie was one of the 'fittest' people on the planet. Was lifetime fitness possible? And what about all those friends who were virile and fit when young but later in life seemed to acquire the obligatory 'beer gut' and extra 20 kg. I didn't want a period of fitness in my life. I wanted lifetime fitness so I could take up surfing in my eighties if I so wanted. I finally decided enough was enough. I put together everything I had learned over the years about fitness and health and combined it with my university research (on the 'original' diet of humans) and embarked on a program to give me the body I wanted and my ideal body weight. It is a work in progress but as you can see from the photo below there is some merit in my philosophy. I dropped from a 38 inch waist to a 32 inch waist in 12 weeks and all I did was weight train 3 times a week for 20 minutes and cut all sugar out of my diet (which meant getting rid of the cafe lattes/hot chocolates/capuccinos). Is it an incredible transformation? No, but it also didn't take much to achieve it. The difference with this site is that I am like you. Genetics is not on my side, I have family commitments, I struggle to achieve my goals in the face of all the distractions in my life. I sometimes take 1 step forward and 2 steps back and sometimes I live on nachos and coffee for a week but I keep returning to fitness and a healthy lifestyle. I do not have the body I want yet but after a lifetime of failure with it, my body is beginning to change to what I want it to be because I have implemented the activities that I mention on this site. I am now 80kg with much of it muscle but i still have a way to go. I am not a guru but I hope this site will help you achieve your goals as well, as you pursue lifetime fitness.